The City of Kraków held an open competition during October, inviting the public to submit proposals on how they could use and promote their new Kraków tartan. A case of, ‘thanks very much Edinburgh for the lovely tartan, but what do we do with it?, let’s ask the people of Krakow, they’ll know!’. The winning entry, selected by the competition jury, was a proposal for a TARTAN TRAM. 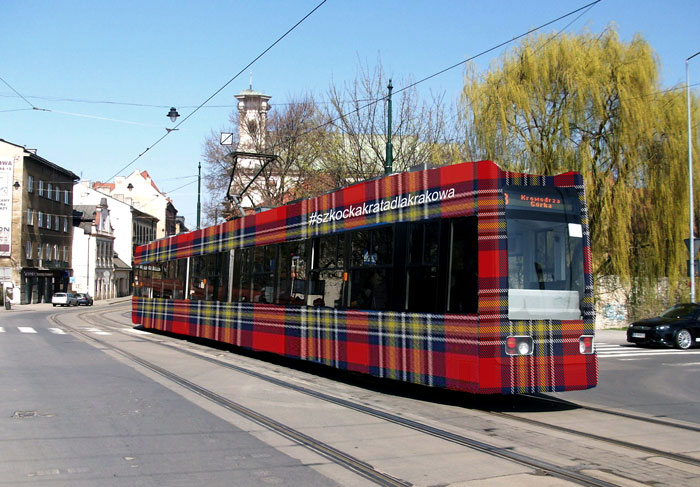 A visualisation of the tartan tram submitted as part of the winning proposal. The city will now submit a contract to the tram operator MPK , to decorate the tartan tram, which will enter service on a route, chosen by MPK. The tram will operate for the whole of 2018. Observant readers familiar with KED may recognise the name of the winner ! One of Kraków’s partner cities is the City of Edinburgh, who recently, in conjunction with the Scottish Polish Cultural Association, held a competition to design a new Kraków Tartan as a gift to Kraków from the people of Edinburgh, to celebrate the long standing partnership. The city held a 2 day Tartan Festival in September when the tartan was presented to the president and the people of Kraków.